Angiogenesis is essential for uterine decidualization, the progesterone-mediated transformation of the uterus allowing embryo implantation and initiation of pregnancy. In the current study, we define the vasculature, expression of Notch proteins and Notch ligands, and Notch activity in both endothelial cells and vascular-associated mural cells of blood vessels in the pre-implantation endometrium and post-implantation decidua of the mouse uterus. We used immunofluorescence to determine the expression of Notch in endothelial cells and mural cells by co-staining for the endothelial cell marker, CD31, the pan-mural cell marker, platelet-derived growth factor receptor beta (PDGFR-β), the pericyte markers, neural/glial antigen 2 (NG2) and desmin, or the smooth muscle cell marker, alpha smooth muscle actin (SMA). A fluorescein isothiocyanate-labeled dextran tracer, was used to identify functional peri-implantation vasculature.CBF:H2B-VenusNotch reporter transgenic mice were used to determine Notch activity. 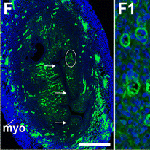 Notch signaling is observed in endothelial cells and pericytes in the peri-implantation uterus. Prior to implantation, Notch1, Notch2 and Notch4 and Notch ligand, Delta-like 4 (Dll4) are expressed in capillary endothelial cells, while Notch3 is expressed in the pericytes. Jagged1 is expressed in both capillary endothelial cells and pericytes. After implantation, Notch1, Notch4 and Dll4 are expressed in endothelial cells of newly formed decidual capillaries. Jagged1 is expressed in endothelial cells of spiral arteries and a subset of decidual pericytes. Notch proteins are not expressed in lymphatic vessels or macrophages in the peri-implantation uterus. We show Notch activity and distinct expression patterns for Notch proteins and ligands, suggesting unique roles for Notch1, Notch4, Dll4, and Jag1 during decidual angiogenesis and early placentation. These data set the stage for loss-of-function and gain-of-function studies that will determine the cell-type specific requirements for Notch proteins in decidual angiogenesis and placentation.